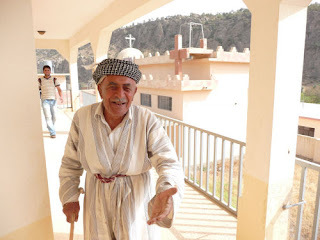 Archbishop Louis Sako of Kirkuk told Catholic charity Aid to the Church in Need (ACN) that a poor electricity supply as well as a lack of clean water, schools, jobs and healthcare in Kurdistan was speeding up the emigration of Christians from the country. His comments come amid reports of a series of attacks against Christians and churches over Christmas and the New Year in and around the city of Mosul. The situation is prompting many faithful to escape further north to the relative peace of the area controlled by the Kurdish Regional Government. 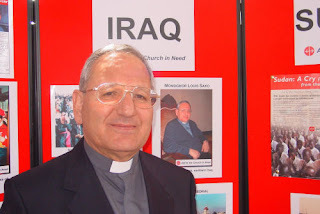 Archbishop Sako’s comments come at a time of increasing concern for the Church’s survival in Iraq amid reports that the country’s Christian population has plummeted to barely 300,000. At the time of the last census, in 1987, Christians totaled 1.4 million. His comments come as winter bites deep into the mountainous Kurdish region where the government built villages for displaced people – often constructed out of poor materials. Prioritizing help for the Middle East in line with a direct request from the Vatican, Aid to the Church in Need has given over $70,000 in emergency help for stricken Christmas families in and around the northern Iraqi city of Zakho. Christmas food packages – including cheese, tinned meat, powdered milk, cooking oil, salt, sugar and soap – have been delivered by Chaldean Sisters in their van. ACN is also providing emergency help for Christians who have fled abroad to countries including neighboring Syria and Jordan as well as Turkey. In the mostly Christian town of Bartilla, about 30 miles north of Mosul, in the Nineveh plain, a car bomb exploded on Monday, January 4th, in a market place. 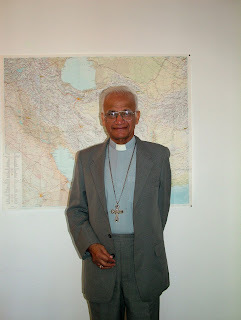 Archbishop Sako said the motive behind the attack was probably political. The blast took place near St. George’s Church, which is in the same town as the church that was attacked on Christmas Day morning by extremists. A dozen people were reportedly injured in the latest attack. Five were hospitalized. The explosion also damaged dozens of homes and shops. Check out this online yearbook of new priests. WASHINGTON—The ordination class of 2009 claims 11 percent Asian-born men, though the percentage of Asian Catholics in the United States is only three percent. Six percent of the class is from Vietnam and two percent from the Philippines. The percentage of Hispanics in the class is also 12 percent, though the percentage of Hispanic Catholics is estimated at 34 percent. Five percent of the class is from Mexico and one percent from Colombia. Three percent are African American, the same percentage as African American Catholics in the United States. The majority of the class, 72 percent, is Caucasian, although Caucasians make up only 58 percent of U.S. Catholics. In the January 2010 issue of the Word Among Us, there are three must read articles on helping us to distinguish between the whispering voice of God the Holy Spirit and the troubling voice of Satan. Remember the persecution of Christians in Orissa, India? These elephants first attacked a rock crusher machine owned by a key leader of the persecution movement. They then went on to destroy his house and farms. Hundreds of villagers have been forced to take shelter in camps in the Indian state of Orissa after repeated attacks by a herd of elephants. 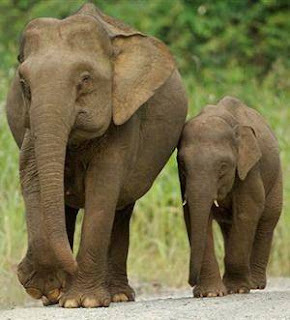 Seven people have been killed and several others injured in attacks by a herd of 12-13 elephants over the past few weeks in Kandhamal district. The leader of Catholics in Pakistan has reported that those attending Christmas Mass went through makeshift security barriers on their way into church as part of a huge security clampdown aimed at stopping attacks on Christians. A massive government security operation was implemented in churches across the country according to Archbishop Lawrence Saldanha of Lahore, who said that the faithful were frightened of being targeted by suicide bombers over Christmas. In an interview in which he praised police for their response to the threats, Archbishop Saldanha told Catholic charity Aid to the Church in Need (ACN) that Mass attendance was in some places up to 40 percent down from normal. But he went on to say that those who did go to church were “very strong in faith” and refused to be deterred by the security risks. The archbishop, who is President of the Catholic Bishops’ Conference of Pakistan, said that “a sophisticated security apparatus” was put in place at in a number of churches in Rawalpindi, outside the capital, Islamabad, including St. Joseph’s Cathedral. Mass-goers lined up before being checked by police using metal detectors and other security devices. Elsewhere, the faithful were protected by uniformed and plain-clothes police stationed at churches across the country. In some areas, services were scaled down and after-Mass festivities, including fairs and other community celebrations, were cancelled to reduce the security risk. Christmas functions in non-religious buildings such as hotels and schools were also cancelled or scaled back following police advice. The stepped-up security comes after the country was put on red alert following a series of attacks across the country. About 90 people in the north-west were killed in an attack on a volley ball game on Thursday (Dec. 31st, 09). The incident came a few days after attacks in the coastal city of Karachi left 30 dead, almost the same number who died in an attack on a mosque in Rawalpindi a month ago. The archbishop added that the security was heightened in response to threats of attacks linked to the Shiite Islamic holy day of Ashura, which this year took place very close to Christmas. Extra-tight security in Rawalpindi was linked to the nearby Army headquarters, he added. Archbishop Saldanha went on to thank Aid to the Church in Need for its ongoing pastoral support and the prayers of the charity’s friends and benefactors. Pakistan is a priority country for ACN information and action. 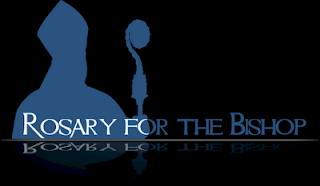 In 2008, the charity gave over $500,000 for projects including the repair and construction of churches and other Catholic buildings, distribution of Bibles, support for Christian education, help for Sisters, support for transportation needs, and Mass stipends for priests in poor and remote areas. Non-Muslims generally harbor a pejorative view of Islam. 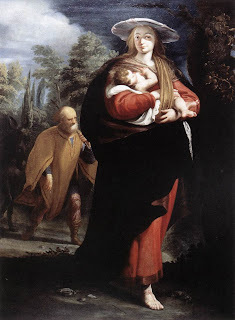 This presentation offers a different perspective, a Marian outlook espoused by the late Archbishop Fulton J. Sheen in his book, The World’s First Love, and shared by other devotees of the Blessed Virgin Mary. Islam is the only great post-Christian religion of the world. Since it originated in the seventh century under the leadership of Muhammad, it was possible to include some elements of Christianity and Judaism along with some customs of Arabia. Islam seems to use the doctrine of the unity of God, his majesty and his creative power, to reject Christ as the Son of God. Not understanding the notion of the Trinity, Muhammad recognizes Christ as a prophet announcing himself, that is, Muhammad. Christian Europe, the West, barely escaped eradication at the hands of the early Muslim jihadists. At various times the Muslims were repulsed near Tours, Vienna, Lepanto and other areas. The Church across North Africa was destroyed by Muslim invasions. Presently Islam is again on the rise and flexing its power. If Islam is a heresy, which Hilaire Belloc declared it to be, it is the only heresy that has never declined. Rather, it has rebounded. Other heresies experienced a period of vigor and influence, but later declined and lapsed into doctrinal decay at the death of the leader, and eventually faded away as a social movement. Islam, on the contrary, endured and has not declined in numbers or in the loyalty of its followers. On the surface of things, the missionary efforts of the Church with Muslims have failed. They seem almost unconvertible. Muslims believe they have the final and definitive revelation of God and that Jesus Christ was only a prophet announcing Muhammad, the last of God’s real prophets. The problem is how to prevent the hatching of the hundredth egg. Some believe firmly these fears concerning the Muslims will not be realized. They believe that Islam will eventually turn to Christianity, and in a way that missionaries do not expect. These Christians believe that this will happen not through the teachings of Christianity, but through inviting the Muslims to veneration of the Mother of God. This is their line of reasoning. The Annunciation, Visitation, and Nativity are also included in the Qur’an. Angels are depicted accompanying our Blessed Mother and saying, “Oh, Mary, God has chosen you and purified you, and elected you above all the women of the earth.” In the 19th chapter alone are 41 verses about Jesus and Mary. The defense of the virginity of Mary is so strong and clear in the fourth book of the Qur’an that it attributes the condemnation of the Jews to their monstrous calumny against the Virgin Mary. This highlights another point; namely, why our Blessed Mother in the 20th century should have revealed herself in the insignificant village of Fatima, Portugal, so that all future generations will know her as Our Lady of Fatima. Because nothing happens without divine reason, some believe the Virgin Mary chose to be known as Our Lady of Fatima as a pledge and sign of hope to the Muslim people, and as an assurance, that they who show her great respect will one day accept her divine Son too. Evidence to support these views is found in the history of Muslim occupation of Portugal for centuries. When they were finally driven out of Portugal, the last Muslim ruler had a beautiful daughter named Fatima. She fell in love with a Catholic young man. For him she not only stayed behind when the Muslims left, but she also embraced Catholicism. Her young husband loved her so much that he changed the name of the town where he lived to Fatima. 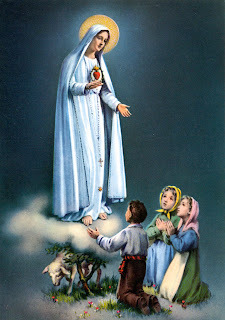 Consequently the very place where Our Lady appeared in 1917 bears a historical connection to Fatima, the daughter of Muhammad. The relationship of Our Lady of Fatima to Muslims is evident in the enthusiastic reception Muslim people in Africa, India, and elsewhere offered to the pilgrim statue of Our Lady of Fatima. They attended prayer services in honor of her and allowed religious processions and prayers in front of their mosques. In Mozambique some Muslims became Christians soon after the statue of Our Lady of Fatima was erected. In a number of countries Muslims frequent Marian shrines to pray and to honor Sayyida. Increasingly we will see that the Christian missionary apostolate among the Muslims will be successful in the measure that it preaches Our Lady of Fatima. Mary signals the advent of Christ, bringing Christ to the people before Christ himself is born. It is sound apologetics, then, for our missionary effort to begin with something the people already accept. Because Muslims are devoted to Mary, our missionaries wisely endeavor to enlarge that devotion with the realization that Our Lady will bring Muslims along the rest of the journey to her divine Son. She never accepts any devotion for herself, but always brings the devotee to her Son. As those who lose devotion to her lose belief in the divinity of Jesus Christ, so those who intensify devotion to her gradually acquire that belief. Many missionaries, in Africa especially, have already broken down the bitter hatred and prejudice of Muslims against Christians by their works of charity, their schools and hospitals, and other social services. 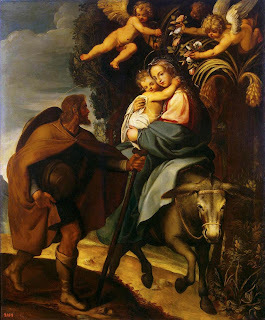 It remains now to employ this Marian approach: to interpret chapter 41 of the Qur’an to show them it was taken from the Gospel of St. Luke and that Mary cannot be seen as the most blessed of women if she had not borne the Savior of the world. If Judith and Esther were prefigures of Mary in the Old Testament, we may assume that Fatima herself was a post-figure of Mary. Let us pray that Muslims acknowledge that, if Fatima gives place in honor of Mary, the reason is that Mary is different from all other mothers of the world and that without Jesus she would be nothing. May they find refuge in the Blessed Virgin Mary, who was given to us by God himself. Mary is clearly a bridge between Islam and Christianity. This prayer is the prayer taught to the Three Shepherd Children at Fatima. In light of the sacrilege against the Most Holy Eucharist, it should be recited daily. 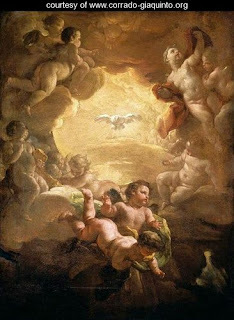 O Most Holy Trinity, Father, Son and Holy Spirit. I adore Thee profoundly. I offer Thee the most precious Body, Blood, Soul and Divinity of Jesus Christ, present in all the tabernacles of the world, in reparation for the outrages, sacrileges and indifference by which He is offended. By the infinite merits of the Sacred Heart of Jesus and the Immaculate Heart of Mary, I beg the conversion of poor sinners. Amen. Well, the desecration, abuse and sacrilege of Consecrated Hosts continues as I others share stories. This is true not only locally but in other places as well. I thought about sharing specifically what these abuses consist of and where, but I do not want to give anyone any bad ideas. Suffice to say, the abuses are pretty bad. Yet, in the few instances that I am aware of, I believe the way people are mistreating the Holy Eucharist has a lot to do with ignorance of what exactly the Consecrated Host is, instead of evil intent. Briefly, to those of you who do not know, a Consecrated Host... the Holy Eucharist... is the Body, Blood, Soul and Divinity of Our Lord Jesus Christ. This is a truth of the Catholic Church. Therefore, even the tiniest speck (particle) of a Consecrated Host contains the Body, Blood, Soul and Divinity of Jesus Christ. I like to use the analogy of a mirror to explain this. If a mirror is broken, even the tiniest piece of the mirror would show the entire reflection of a person or object. The same is true with the tiniest particle of a Consecrated Host. I'd like to share the following video with you because it is self-explanatory regarding Consecrated Hosts and receiving Holy Communion in the hand. Is it any wonder that our Holy Father, Pope Benedict XVI gives Holy Communion to those who are kneeling and who receive on the tongue? It would be a good thing to read Redemptionis Sacramentum's CHAPTER IV Holy Communion 1. Dispositions for the Reception of Holy Communion carefully. "...92. 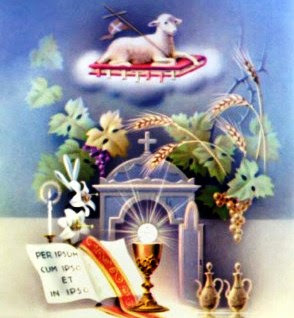 Although each of the faithful always has the right to receive Holy Communion on the tongue, at his choice, 178 if any communicant should wish to receive the Sacrament in the hand, in areas where the Bishops’ Conference with the recognitio of the Apostolic See has given permission, the sacred host is to be administered to him or her. 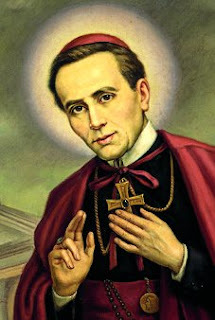 However, special care should be taken to ensure that the host is consumed by the communicant in the presence of the minister, so that no one goes away carrying the Eucharistic species in his hand. If there is a risk of profanation, then Holy Communion should not be given in the hand to the faithful.179..."
Thanks to family friend Sharon for sharing the following: The Upper Egypt Tour Gabal al-Tayr -The Holy Family in Egypt including mention of the bowing tree. And, I have the lovely Catholic Mom in Minnesota my friend Tracy, bestowing this honor on me. Thank you very much Tracy. I am truly touched by the gesture. The rules are as follows...and by the way, all the ladies on the sidebar truly deserve this award. 2. Include at least one new Sister In Faith. These ladies have been blogging with me from almost the beginning...2006. And the new Sister of Faith, is MaryEllen of Grandma's Musings even though I've known Maryellen for a while, she was not with me at the beginning. She therefore falls into the new category.